Red Cube, my crew, and some pics and stories about the Foundation. R.I.P. Robert airing off of the Foundation. One of the first members of Red Cube. 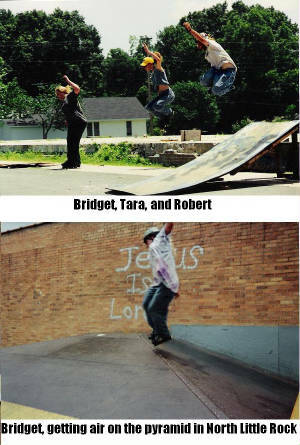 In the summer of 1998, the skate scene in Beebe was exploding. Any given day you could find Rollerbladers or skateboarders at the College or the School. 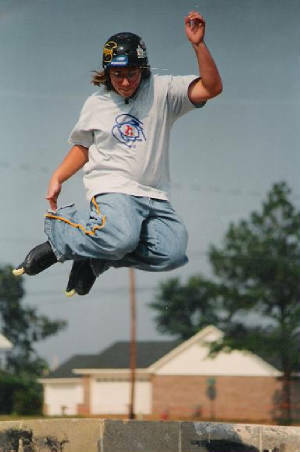 At the time, I was mainly a rollerblader. Some local kids decided to build and construct ramps at a local basketball court. It caused a lot of problems because the basketball players couldn't play basketball (even though there were tons more courts around). We got complaints from the neighbors that we were to loud, destroying property, ETC. Earlier that year, a tornado had ripped down the First Baptist Church, right across the street from the basketball court, and left behind a concrete foundation. Paradise. 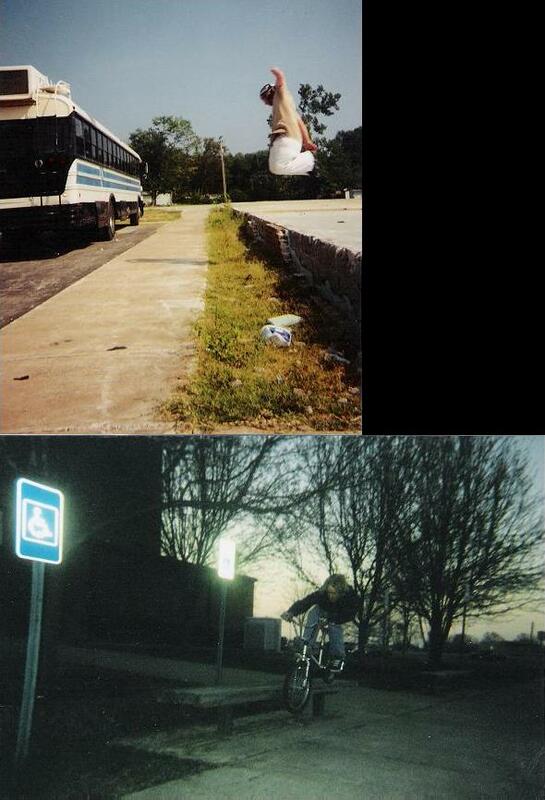 We had gaps, ledges, stairs, drops, anything you would want for a real street skatepark, besides rails. We simply called it, The Foundation. It turned into a local hangout for anybody. There were always kids there. There was a gap between the main part of the foundation to a wheel chair ramp that was about 7-8 feet across. And about 4 feet deep. The kids named it the Shawn gap because I was the only one to ever hop over it on my bike. Good times. It was also a meeting spot for some good sessions. I met Ken there, and he brought Scott along with him. Scott was having a tough time learning to carve one of the ramps there, and now he airs out of quarters huge high. Andy used to call me on the phone and tell me that there was someone new at the Foundation and they were good. So me, being the local hotshot, had to see this. That meant competition for me. I was kinda like the teacher at the Foundation. So whenever a new person came around, I was just thinking competition. Some of that Competition turned into life long friends. Dude, I jumped that dirtpile, clipped my back tire on the way in, and flipped over the bars. I landed first, the bike almost tackled me. Talk about a rush! I miss so much hopping my gap. I got a call from Andy one day, "come out here! There is this dude doing one-eighties! You gotta check this guy out Shawn! And he's riding a Huffy!" 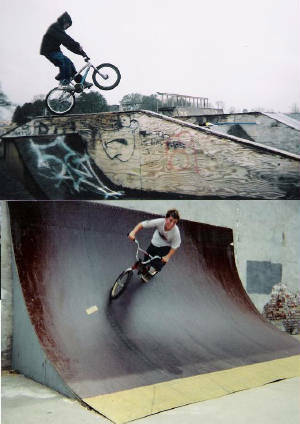 I remember TJ was jumping one of the shady ramps and bruised his spleen. A couple of days later, he went with me and Ken to Springfield Missouri to an indoor skatepark. Bruised spleen and all. Against doctors orders. Yeah. Before I met you, the kids at the Foundation were always trying to get me to do your gap, I never did but I shuould have, No guts...No glory. I bet I could have made it too. They all kept telling me about you, Shawn is so rad,Shawn does the gap,Shawn does one-handers,Shawn's the man. Andy Hall and the rocket air to land rocket manual. One of the first members of Red Cube. Red Cube was a team that I made up because all the other sports, even skateboarding, had them. The first members were Andy Hall, TJ Pemberton, Justin Oakley, Robert McClure, and Shawn McClure. Over time, we built up to be pretty big. There was even a time when there was talk about another group of kids wanted to challenge Red Cube to a contest. The thing was, it wouldn't have been a contest. We were seriously that good. Red Cube consisted of rollerbladers and bike riders. Everybody rollerbladed and rode bikes at one time or another. We were a pretty well rounded group. The Foundation was not the only place Red Cube could be found on any given day. 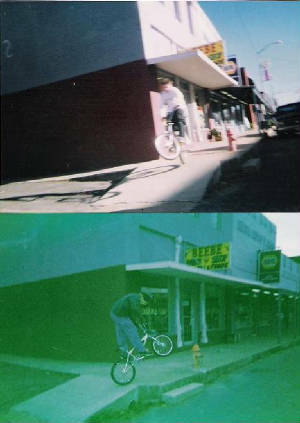 We were constantly riding street, at the school, college, and down town. A couple of us even got arrested for riding at ASU Beebe. 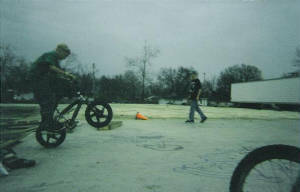 TJ even had dirt jumps in his backyard. We seriously rode everywhere. 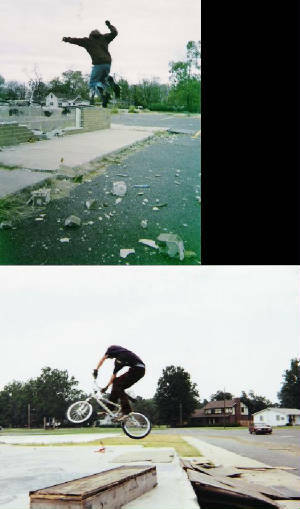 At one time, believe it or not, we almost had a skatepark. It was over the overpass by Knights. The parks and Rec director claimed that the skaters and riders were tearing apart his batting cages so he took it upon himself to tear it down. Thanks Story, I still can't stand you. Shawn and TJ, putting Main Street to good use. Justin Duke, our only flatlander, switching it up with a couple of trackstand variations. At one point, Red Cube had a couple of girls on the team. Bridget skated, and was getting pretty good. She was learning to grind and air fairly well. Tara was my fiance at the time, so she skated with us. Those were the girls on the team, but that is not to say that we did not have girls hanging out at the Foundation constantly. What can I say, skaters and riders are natural chick magnets. Yeah. The summer of 2001, the Foundation saw its defeat. I rode past the Foundation one day and saw a backhoe in the middle of it. A tear rolled down my face, because that was like our home away from home. 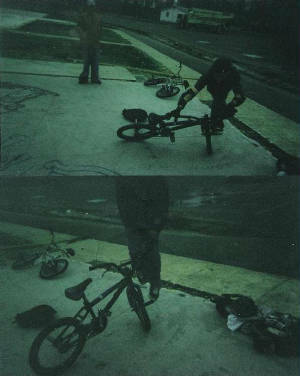 I remember riding with TJ and Andy, teaching them to do barspins on the ground. I remember the rush of hopping my gap for the first time. I remember feeble grinding for the first time at the Foundation on a Specialized 415 down some long wood boxes. I could go on and on. The point that I am trying to make is if you are ever as fortunate as we were with a perfect riding spot, take advantage of it. Once it is gone, the memories will still be there. I promise.